The Full Moon is always an opposition of the Sun and the Moon. 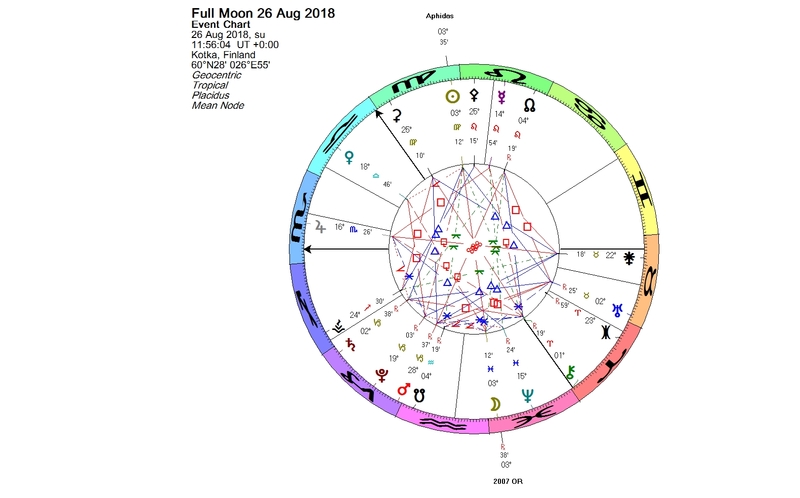 Today’s Full Moon in Pisces was tightly aligned with another opposition, formed by two interesting minor planets. The Moon was in conjunction with a trans-Neptunian object (225088) 2007 OR10, which is orbiting the Sun in the scattered disc, among the coldest and most distant objects in the Solar System. The Sun in Virgo was in conjunction with 121725 Aphidas, the latest officially named centaur. (225088) 2007 OR10 is big. It is the fourth-largest, possibly even the third-largest known body in the Solar System beyond the orbit of Neptune, and the largest known body in the Solar System still without a name. It was discovered 11 years ago, on July 17, 2007, by American astronomers Megan Schwamb, Michael Brown and David Rabinowitz. 2007 OR10 has a moon. In 2016, analysis of Hubble images taken in 2010 revealed a satellite, which was confirmed by a further analysis in 2017. The discoverers nicknamed 2007 OR10 first as “Snow White” for its presumed white color. However, it was later revealed to be one of the reddest objects in the Kuiper belt, so the nickname was dropped. It has also revealed to be bigger than what first was thought. In 2009 I wrote to Mike Brown and proposed naming 2007 OR10 from the Norse mythology, but he replied that he has been saving the Norse mythology for a distant and cold thing like Sedna. In Norse mythology the chief god Odin was at times using a disguise, which would match with the behavior of the object, but the name Odin is already used for an asteroid, so it cannot be used again. There was a petition in the internet for naming 2007 OR10 as R’hllor, also known as the Red God or the Lord of Light, from the HBO series Game of Thrones, based on novels written by George R. R. Martin. There are other objects named from fictional mythologies (for example Borasisi, Manwë, Varda and Albion), so this is not an entirely impossible idea. According to the International Astronomical Union’s rules, the discoverer of a minor planet has the privilege to suggest a name for the planet in question for a period of ten years following the numbering of the object. 2007 OR10 received the permanent number in 2009, so Mike Brown and his team will have some time left for their name suggestion, and then anyone will be able to make a proposal. Hopefully both bodies get named. People born with their Sun in conjunction with 121725 Aphidas are for example Anna Nicole Smith, Anneliese Michel, Rick Allen, Robbie Williams, Theresa May, Mr Lordi (Tomi Putaansuu). Oct. 15, 1951 – Norethisterone, the progestin used in the combined oral contraceptive pill, is synthesized by Luis E. Miramontes in Mexico. Sept. 30, 1955 – Actor James Dean is killed when his automobile collides with another car at a highway junction near Cholame, California. Nov. 24, 1966 — The Beatles begin recording sessions for their Sgt. Pepper’s Lonely Hearts Club Band L.P.
Dec. 3, 1967 — Christiaan Barnard carries out the world’s first heart transplant at Groote Schuur Hospital in Cape Town, South Africa. May 20, 1983 — Two separate research groups led by Robert Gallo and Luc Montagnier independently declared that a novel retrovirus may have been infecting people with HIV/AIDS, and published their findings in the same issue of the journal Science. May 29, 1985 — Heysel Stadium disaster: Thirty-eight spectators are killed in rioting on the terraces during the European Cup final between Liverpool F.C. and Juventus at Heysel Stadium in Brussels, Belgium. This entry was posted on Sunday, August 26th, 2018 at 8:09 pm	and is filed under Full Moon. You can follow any responses to this entry through the RSS 2.0 feed. You can leave a response, or trackback from your own site.